3 ft. 6 ft. 10 ft. 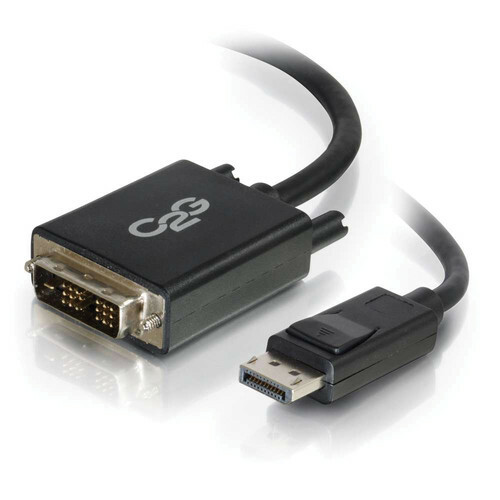 The black C2G DisplayPort Male to Single Link DVI-D Male Adapter Cable is 3' long and offers a useful solution for connecting the DisplayPort output of a standard or laptop computer to the DVI input of a computer monitor. This cable carries a digital video signal, and supports up to a 1920 x 1200 resolution. Box Dimensions (LxWxH) 6.0 x 4.6 x 1.0"
DisplayPort Male to Single Link DVI-D Male Adapter Cable (3', Black) is rated 5.0 out of 5 by 2. Rated 5 out of 5 by Neecer from Cables To Go have quality products and quality people. We have a 2 monitor hook up to each computer. The dvi cable works great in the 6 ft length.